So, a big part of this blog are the improvement ideas to my current apartment. It's 600 sq ft of "all mine" that I am completely at home and enamored with! Although it can feel a bit crunched at times, I love that I'm limited with a certain amount of space to continue to improve upon - this will make for some pretty awesome posts to come! Please check out my recently updated "My Apartment Page" for updates on the current and before looks! I'm still trying to find the best ways to take pictures of my small spaces, and I'd love any feedback or tips if you've got them (aside from buying a wide-angle camera lens.) I also know I need to get better images of my bedroom and "Craft Closet" up soon, so please watch for that! I have lots of ideas for projects that I will be doing to my space - one of which I promise I'll be doing this week, so watch for that!!! But these current pictures are an overview of what I've already done. I'd love to hear your take on it so far! 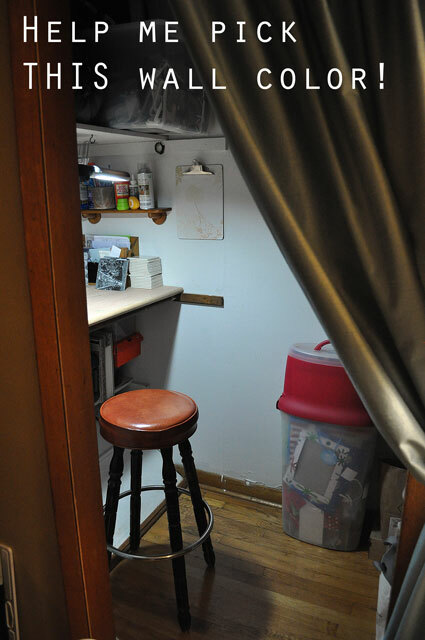 Here is my messy, but soon-to-be organized and awesome "Craft Closet"